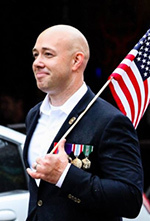 Freshman U.S. Rep. Brian Mast, R-Fla., says he's raised over $700,000 for his reelection bid in 2018, adding precious financial resources Mast will most assuredly need next year. Mast made the announcement via email Thursday afternoon, paying special attention to a large amount of smaller donations which his team says indicates a swarth of grassroots support. Campaign contribution reports are due to the Federal Elections Commission July 15. Democrats already have their eye on Mast, a rising star on Capitol Hill. Mast is one of 59 members of Congress the Democratic Congressional Campaign Committee has announced they will target in 2018 to take back seats in the House. So far, Mast's only current challenger for the 18th Congressional District is Democrat Pam Keith, who ran for U.S. Senate last year.